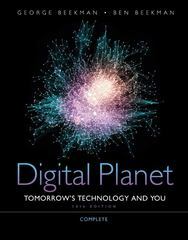 Digital Planet 10 Edition Completely updated, Tomorrow’s Technology and You, provides you with an understanding of information technology so you can successfully navigate change and advance into the future. Today we’re standing at the junction of three powerful and rapidly evolving technological forces: computers, communications, and digital entertainment. Computer technology is showing up in everything from automobiles to home appliances to telephones to televisions, and the lines that separate these machines are fading. This digital convergence is rapidly–and radically–altering the world in which we live.